In a large sauté pan or shallow casserole heat the oil and the butter on medium high heat, Sauté the onion for 3 to 5 minutes or until softened. Add the turnips and parsnips and sauté the vegetables, stirring to coat them, about 3 minutes. Add the garlic and cook another minute. Add the stock and place over medium-high heat. Bring to a simmer, cover and simmer until the vegetables are tender, about 15 to17 minutes. In a food processor fitted with the metal blade, process the vegetables and stock until smooth. Add salt and pepper and cream if desired and process to mix well. Taste and adjust the seasonings. To serve transfer puree to a serving bowl and garnish with parsley. Or Serve in a shallow casserole dotted with breadcrumbs and butter and baked until brown and crispy. May be prepared up to 1 day ahead, covered and refrigerated. Gently reheat in a saucepan just before serving. Working in 2 batches, puree chopped tomatoes, vegetable juice, 1¼ cups chopped cucumber, ½ cup chopped red onion, extra-virgin olive oil, 2 tablespoons chopped basil, red wine vinegar, mayonnaise, garlic, and anchovy paste in blender until smooth. Transfer to bowl. Season gazpacho to taste with salt and pepper. Cover and refrigerate at least 4 hours and up to 1 day. Stir remaining 1 cup chopped cucumber and ½ cup chopped red onion into gazpacho. Refrigerate 2 hours. Divide gazpacho evenly among bowls. Garnish with chopped basil and Parmesan croutons, if desired. In a large soup or stock pot combine the stock or water, brisket, beef shanks and bouquet garni on medium heat. Make sure that the beef is well covered with liquid. Bring to a gentle simmer, uncovered, making sure it does not come to a rolling boil, about 20-30 minutes. Use a slotted spoon and skim the scum and froth from the top. Partially cover the pot, reduce the heat to low, and gently simmer the meat for about 2 1/2 hours, or until the meat is fork tender. Skim the soup periodically to remove the impurities. Remove the meat to a platter, using a fork and a slotted spoon. Cover the meat with foil to keep warm. Add the vegetables and salt, and gently simmer on medium-low heat for another 20 to 30 minutes or until the vegetables are just tender. Discard the bouquet garni. While the vegetables are cooking place the mustard, horseradish cream, sea salt and gherkins in small ramekins. Place on the serving table. Slice the bread and place in a basket for serving. Place the brisket and shank meat on a cutting board. Thinly slice the brisket against the grain and break up the shank meat into pieces. Taste the soup and season to taste if necessary. 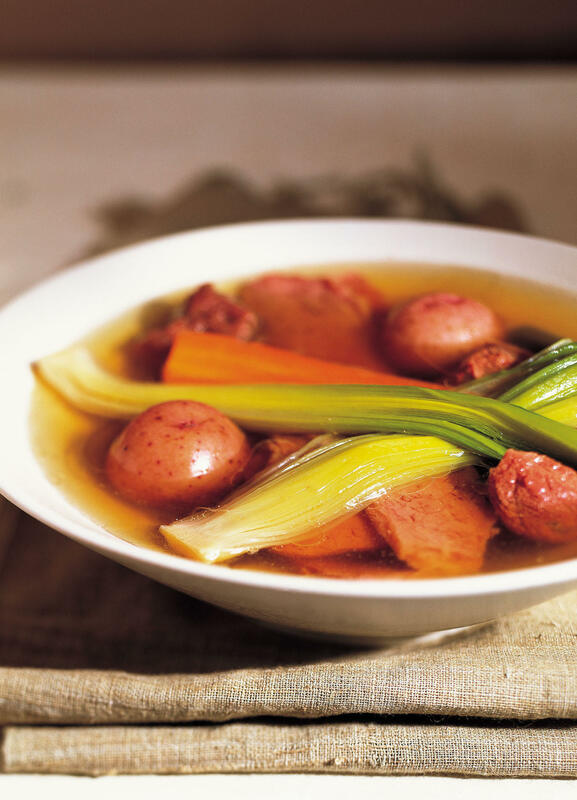 Place some meat and vegetables in each soup bowl and ladle over the broth and serve immediately. Serve with the condiments. Pass sliced bread to dip in the soup. To make a bouquet garni, cut a double thickness of cheesecloth into a 4-inch square; place 2 tablespoons of black peppercorns, 2 bay leaves, 1 small leek (white part only) on top; tie with kitchen twine. In a medium soup pot, heat the oil over medium-high heat. Add the leeks and saute for 4 to 5 minutes or until softened. Add the carrots and celery and cook for another 4 minutes, or until they begin to soften. Add the garlic and cook for a minute, or until slightly softened. Sprinkle the flour over the vegetables, reduce the heat to low, and continue to cook, stirring constantly for a minute or until the flour is thickened and incorporated into the vegetables. Add the tomatoes, tomato paste, sugar and broth, raise the heat to medium-high, and bring to a simmer. Partially cover the pan, reduce the heat to medium, and cook, stirring occasionally for 15 minutes or until the vegetables are tender and all the flavors are well blended. 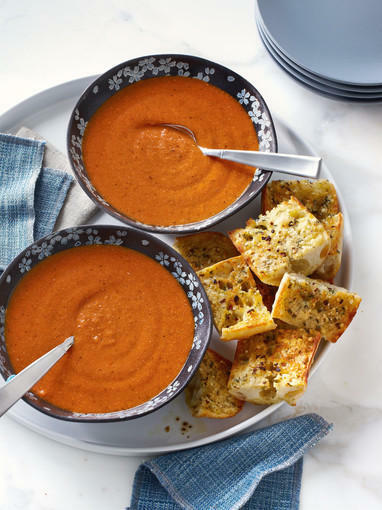 With an immersion blender, puree the soup, or if you prefer a finer texture, use a blender. (If using a blender, cool the soup so the top of the blender doesn’t come off. And hold the cover down so that there won’t be any unexpected surprises.) If you want your soup totally smooth, pour it through a fine-mesh strainer after you have blended it. Add the milk to the soup over medium heat, stirring to combine, and cook for another minute. Add the salt and chipotle sauce and taste for seasoning. If you prefer the soup thinner, add more milk or broth to reach the desired consistency. 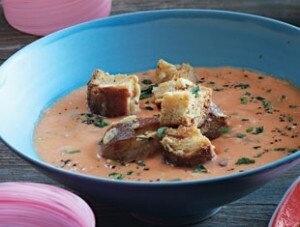 Ladle the soup into soup bowls and garnish each bowl with a few croutons. The soup may be prepared ahead through step 3, covered, and refrigerated for up to 2 days or frozen for up to 1 month. Defrost and warm the soup, and proceed with the recipe. If you can’t find the chipotle variety, try adding a dash of your favorite hot sauce. Another variation is to add a rind of Parmesan cheese to the soup while it is cooking. Remove the rind before adding the milk, and garnish each serving with freshly grated Parmesan cheese. For a more substantial soup, add diced cooked chicken or cooked quinoa. Serve this as a starter or as part of a main course, along with your favorite grilled cheese sandwich, bagel chips or garlic bread. In a large blender, combine the cucumber chunks, peas, scallions, mint, and broth and blend on high until completely puréed. Add the sour cream and lemon juice, season with salt and pepper, and blend well. Taste for seasoning. (If the soup is not totally smooth you can pour it through a fine-mesh strainer over a bowl.) Refrigerate the soup until chilled, at least 4 hours. To make the relish: Combine the diced cucumber, peas, mint, and lemon juice in a small bowl. Season with salt and pepper and mix to blend well. Taste for seasoning. Just before serving, stir the soup, which may have separated during refrigeration. Pour the soup into small bowls and garnish with the sour cream and relish. Serve immediately. This may be made through step 3 up to a day ahead, covered, and refrigerated. Readjust the seasonings and mix to blend well before serving. In a medium saucepan, melt the butter in the olive oil. Add the leeks and cook over moderately high heat, stirring, until softened, about 3 minutes. Stir in the broccoli, garlic and stock, season with salt and white pepper and bring to a boil. Cover partially and simmer until the broccoli is tender, 20 minutes. Meanwhile, in a small bowl, stir the sour cream with the lemon zest, lemon juice, chives and Parmesan. Season with salt and white pepper. Transfer the soup to a blender and puree in batches until smooth. Stir in half of the lemon-chive cream. 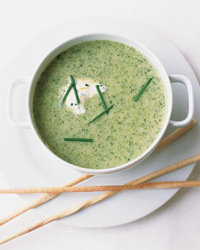 Ladle the soup into shallow bowls and serve the remaining lemon-chive cream on the side. In a large saucepan heat the oil over medium-high heat. Saute the onion, celery, carrots, garlic and bay leaf until the vegetables are softened, about 5 minutes. Add the curry powder and stir to release the flavors, about 1 minute. Add the plum tomatoes and their juice, lentils, stock and sliced lemon to the saucepan. Bring to a simmer and cook partially covered and stirring occasionally, until the lentils are tender, about 30 minutes. Remove the lemon slices. Just before serving, stir in the spinach and simmer on low heat until the spinach is wilted but bright green. Taste for seasoning. 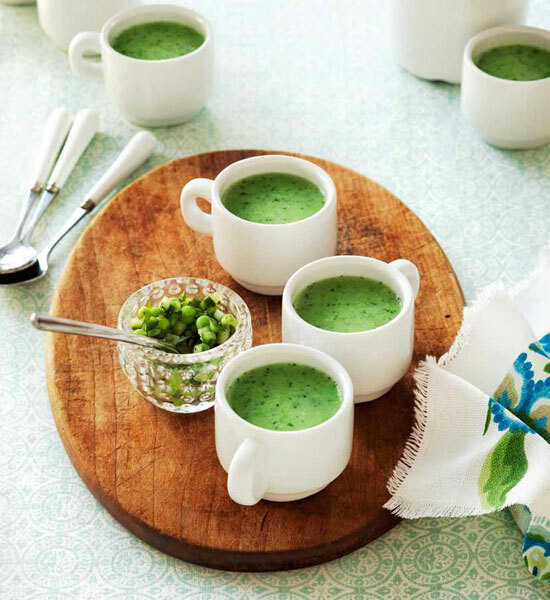 Ladle into soup bowls and serve immediately.